An Irrawaddy dolphin calf showing its smile at Kampi pool in Kratie province, northern Cambodia. The Irrawaddy is a shy, small dolphin that is dark grey in color with a pale underside, a small rounded dorsal fin, and a bluntly rounded head. The Mekong Irrawaddy dolphin is the proud symbol of the Mekong River and its biodiversity. The Mekong River is one of the world’s most important remaining freshwater habitats for this species and supports the largest of the five remaining freshwater populations. Intensive conservation measures are needed to protect this highly vulnerable population from threats like disease, death in gillnets, or pollution. WWF is involved in the conservation of this iconic mammal as a member of the Cambodian Mekong Dolphin Conservation Project. 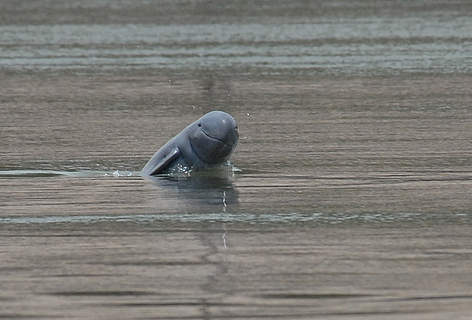 Read about the Irrawaddy Dolphin as a flagship species for Mekong River conservation. Read our latest Mekong Dolphin Population Survey.